High enzyme foods are one of the four main foundations of the E-Factor Diet plan. Enzymes are important because they help to digest the food that enters your body. As John Rowley stated in his book, it’s not only about what you eat that matters, but also what your body can absorb. When you eat nutrient dense foods, you need enzymes to digest and absorb those nutrients. Without enzymes, most of the nutrients won’t be absorbed by your body. You may even eat a lot but still feel hungry because your body has not received the nutrients it needs. Enzymes come from enzymatic foods, such as plants and animals. Most foods with good enzyme are fruits and vegetables. 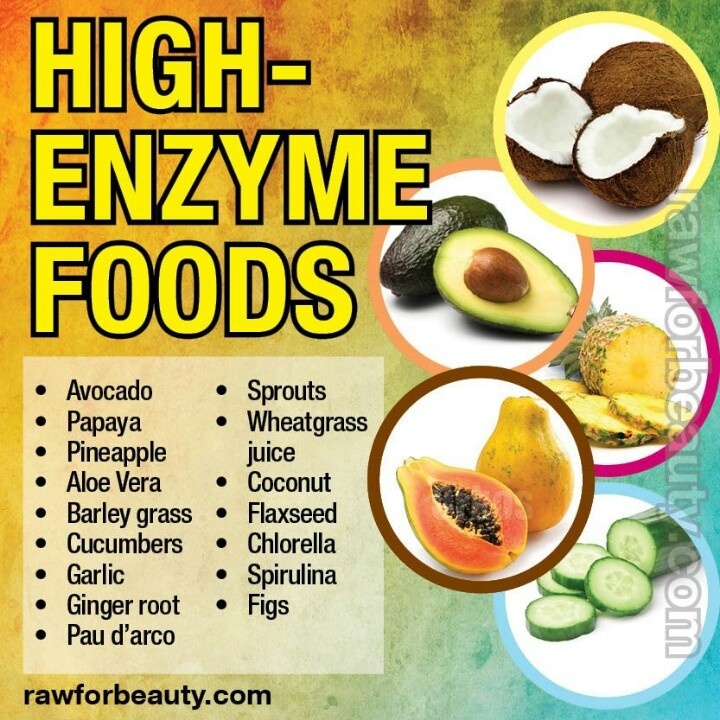 The picture above gives a short list of various foods that are high in enzymes. Papaya contains the enzyme papain that digests protein. When you are trying to lose weight, eating enough protein is important to maintain muscle mass. Eating papaya supplies you with the enzymes you need to digest the meat you eat. You should eat papaya on its own around 30 minutes before your meal to allow the enzymes to settle in your body. Pineapple contain the enzyme cysteine proteinase that also digests protein. Similar to papaya, you can eat pineapple to help digest protein to ensure you meet your daily protein needs. You should also eat pineapple around half an hour before your next meal. Avocado contains the lipase enzyme that digests lipids. Lipids is the scientific name for fat, so eating avocado helps you to digest the fat you eat. Similar to protein, and contrary to what you may hear, eating fat is very important to lose weight. If you are not losing weight, it may be because you are not eating enough healthy fats. Nuts and seeds such as almonds, pecans and walnuts are high enzyme foods in their natural form. However, roasting or heating these nuts will make their nutritional value decrease. Therefore, it’s advised that you eat whole nuts and seeds in a raw manner. The same principle applies to the other foods. If you notice, most of the foods mentioned in the image above can be eaten raw without processing. Eating these foods raw is a good idea because heating or cooking them can destroy the enzymes. You can eat fruits and vegetables raw without processing but make sure to wash them clean first before you eat them. By eating high enzyme foods before your main meal, you can absorb more nutrients. Your digestive system will be supported by the additional enzymes you eat. The foods you consume will give you more nutrients to use to support burning fat and maintaining muscle.